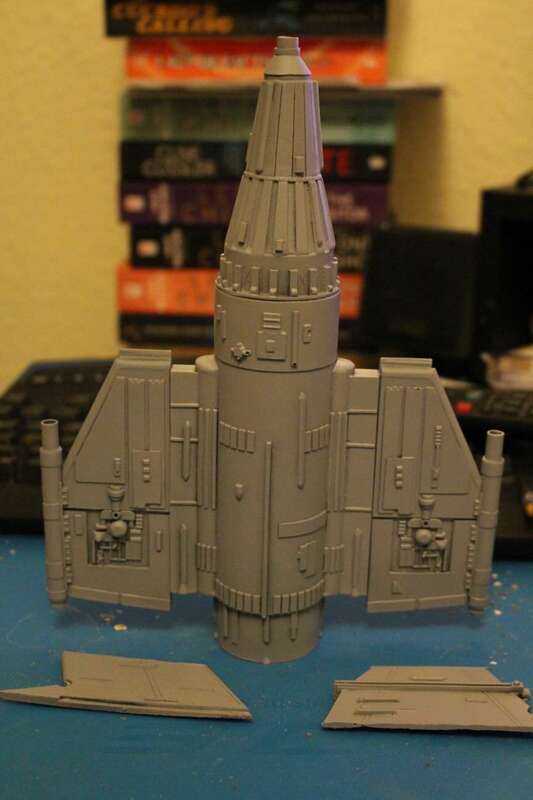 ModelSpace » Other Modelling Forums » Star Wars, Thunderbird 2, SciFi & Space Forum » SciFi, Space & 'other' Star Wars Build Diaries » Titan Find Federation Pursuit Ship from "Blake's 7"
OK, I have got this little beauty with me, and she's ready to go. Titan Find used to do a very nice range of resin kits of craft from the classic BBC show "Blake's 7". I have a number of their kits waiting in my stash, the "Liberator" herself, this interceptor, the "Scorpio" from the final season, and the Civil Administration ship "London". Titan Find kits are the best resin kits I have found. The detail is crisp, there are minimal to no bubbles or flash, and where possible the parts are hollow. The Federation Interceptor is the main 'bad guy' ship in the series, and there were a number of slight differences between them. I will have to do a bit more research as I seem to remember that the ones used in the final season had had a re-paint and I want to get the colour correct for the first season. I hope to have pictures of the kit as it comes up tomorrow, with updates each weekend on the construction work. This is one model where I can paint all at once after construction is complete, so paint will not be applied until later in the year. Hope you enjoy the build - I know I will! First is a general overview of the parts. First impressions are excellent with most of the details pre-moulded into the castings. The main body is hollowcast in black resin - the majority of the parts are this black resin, but this is the only hollowcast piece. It really helps keep the weight down. There is some markings where the two halves of the mould went together, but less pronounced than the vast majority of resin kits I have seen and it has been kept away from any detail as much as possible. These are the parts that come with the kit, mostly in the black translucent resin. 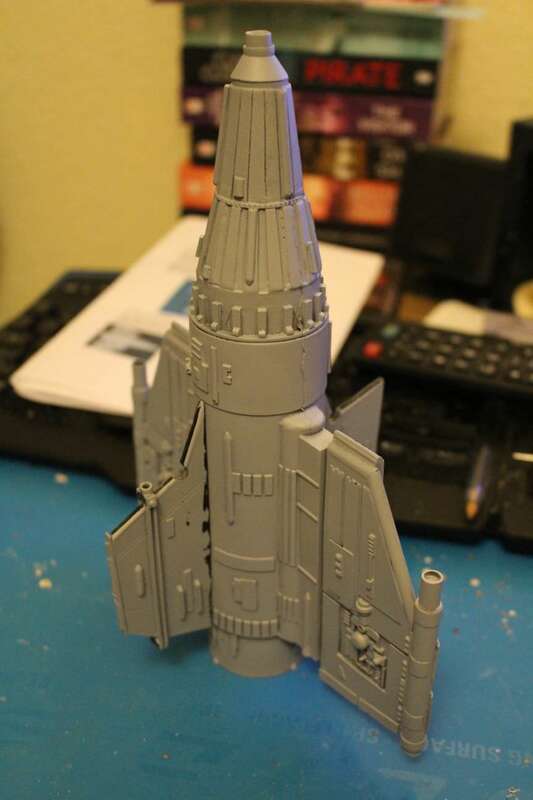 I suspect that the finished model will be areound 10-12" long from the back engine plate to the tip of the nose cone. This is where the care and attention to the production of this marvelous kit comes to the fore. The wing roots have part of a morice and tennon joint which is offset from the centreline. If the wings are put on the wrong sides, they force the wings to be offset. The wings will be almost flush on one side, and have a large step the other. If the wings are the correct way up, they will sit properly and central up the wing root. Wing incorrectly placed on the wrong root, showing the large step from wing surface to wing root. The other side of this wing is flush with the height of the wing root. Correctly placed wing showing much smaller step which is mirrored on the other surface, the wing is correctly alighned with the wing root. This picture shows how thin some of the areas in the wings are. Unless there is light behind the wing, these areas look just like the rest of the wing. 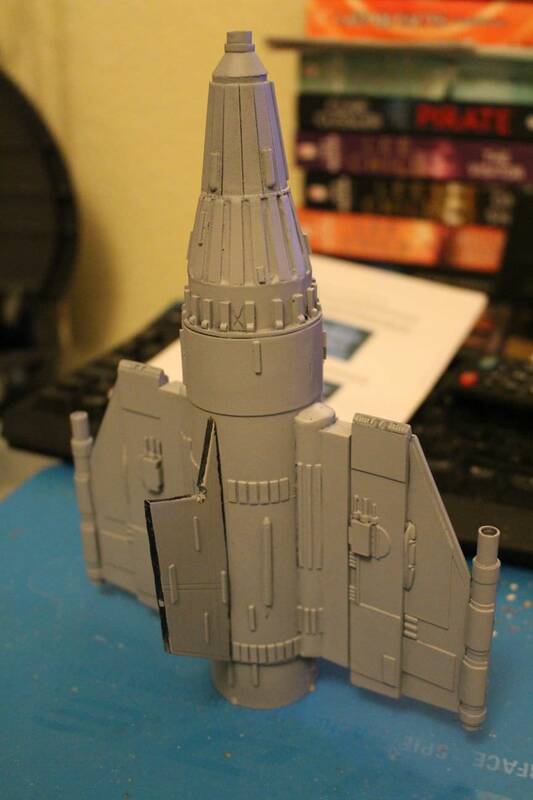 This shows that in reducing the size of this model from the studio models, you couldn't have gone any furter and retained the accuracy. Here is the main body with the wings just pushed on for the moment. Like all resin kits, it needs a wash and some fettling of the mould lines before anything is glued. There are also the dorsal and ventral fins to be cleaned up and glued. The attachment of thse has also been thought about as each one has a rail on the body that it connects to. This increases the glue area and eill give a strong bond when completed. They are also of different lengths, so putting the wrong fin in each location will leave the modeller with the fins starting at different locations. I may well spend all week with little bits here and there washing parts and clearing them, so I hope to have something more for you in a weeks time. Nice kit, looking forward to this one. Thanks for the kind comments and encouragement all of you. For those of you that are interested, here is a link to the images of all the Titan Find kits I own. The only one I am aware that I am missing was the 'System' interceptor, the one that looked like one of the "Liberator" 's weapon pods with a small, red drive sphere at the back. I now what you mean, Phil. she's just such an iconic ship. However, in terms of these models, the London is far more impressive due to the physical size of her. The London is a 1:1 match for the filming model. OK, I'm afraid I was away the end of last week and over the weekend, so there has been quite a gap since I last posted, but here is the update. I have taken the main body, both wings, and both fins, and given them all a good wash in household detergent. Once they were all dry, I havfe undercoat/primed them with a couple of light coats of "Mr. Surfacer 1000". 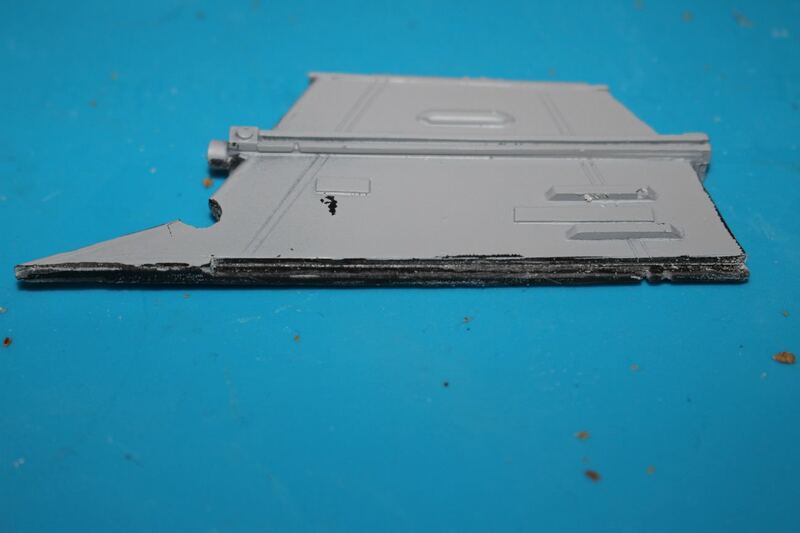 This has primed the parts grey, covered a number of small pinholes, and shown where other problems will need addressing later. As can be seen here, there are a couple of bubbles around the detail parts in the area around the RCS thruster from the Saturn V kit. A closer shot of just the fins. This shows that there is some work to be don around the area the fins join to the body. There is a slight excess of resin which will need to be trimmed off to enhance the look at the joins, and I quite expect to find a bubble or two when I do. And a really close up shot of the Dorsal fin, showing more of the clean-up required before the fins will mate properly with the body. The two superglues I use. The Loctite is a medium viscosity that does not generally flow too much, and gives a reasonable bond for a general purpose superglue. 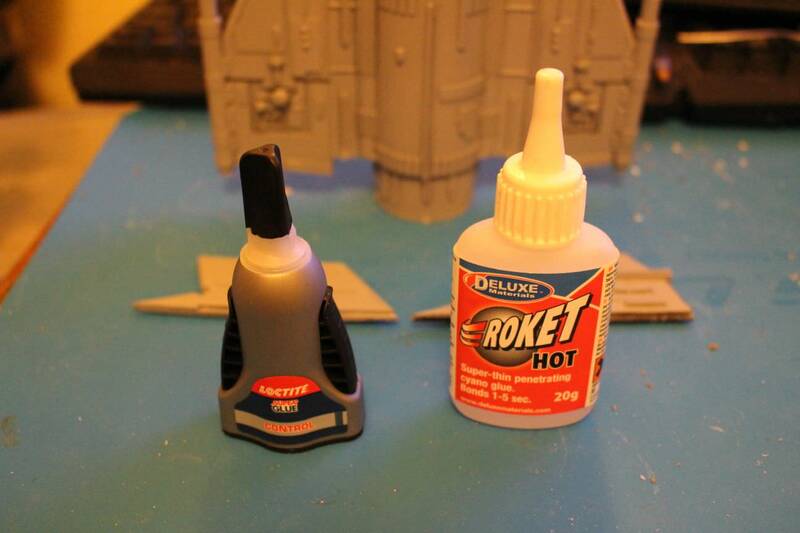 The Roket Hot is a low viscosity that can then be carefully added to increase the area caught by the glue and make the bond stronger. 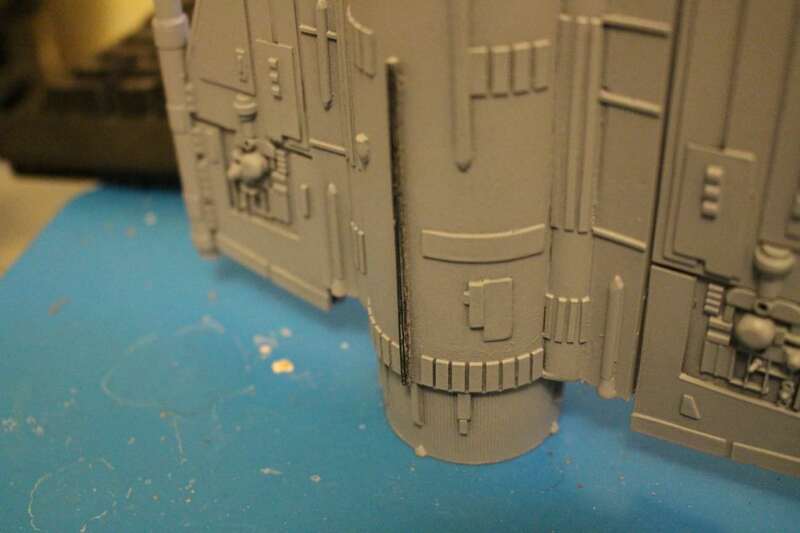 You just have to ensure you are only using the smallest amount at a time or you will end up with more superglue running out the bottom and destroying detail further down the model from where you are gluing. It is also advisable to make sure the first is properly cured before you use the second, so I generally give it 48 hours before using the Roket. This is having preparred the area to be glued. I have removed the primer from the surfaces which will form part of the join to give a better bond strength as it will not rely on the bond of the primer to the surface and the bond of the glue to the primer. Having glued both fins on, I am now ready to look out my filler and finish off the joints, but that's as far as I have got so far. I should have more time to work on her this weekend. Note the m ould line running up the nose from the wing root. This will have to be removed, possibly part filled and part sanded away, to make that section smooth again. There is also an 'X' marking clearly visible in this last shot. This is to mark the location of a detail piece which will go on bnefore the main paintwork is applied. 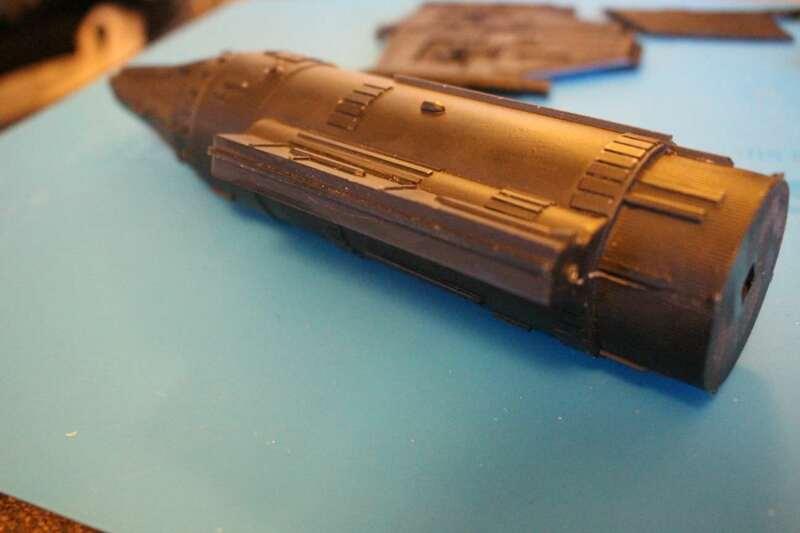 Before I go for the main colour, I will have all the detail in place except for the antenna array, as that is just too liable to be broken whilst it is being painted. At this stage, the wings are still removable, so I can get to the fin root work done with the minimum of fuss. The wing roots look much better and easier to hide the joins than the fins will be, so tyhat is why I am doing it all this way. The assembly of this kit is not really that hard, but it is in the paint job [and the custom base I am currently planning] that will make or break this model. A single colour coat, decals, and a bad base will ruin it. A good paint job, pre-shading, and picking odd panels out in a slightly different colour will really enhance the look and realism, and a good base to show it off but not eclipse the work done on the model will make it an award winner. Coming on very nicely. Is it me or do those bottles of glue look similar shape to the model. Good and bad news, I'm afraid. Bad news is that I am withdrawing this from the BOTY. I will not be able to finish her in the timeframe left as my personal life went into free-fall back in May. I have not done a thing on her since my last post. Although it would still be possible to finish IF I had the weather to airbrush outside, and some major motivation, I fear I won't get any of the first, and not enough of the second. I am therefore sadly withdrawing form this year's competition. The good news is that by the time I start on next year's entry, I plan on having a place of my own where I can spray whatever the weather. I will then be able to finish this project, the Dalek, and all sorts of other things I have in the pipeline. I will be back!